With Gov. 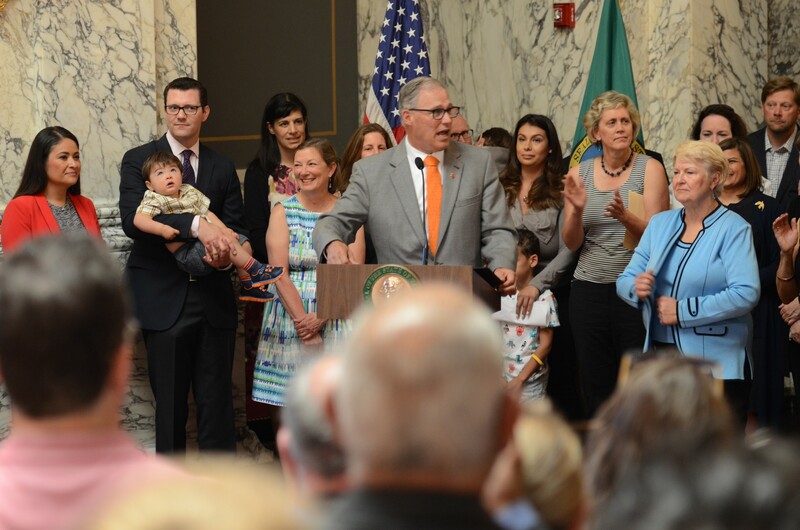 Jay Inslee’s signature today, Washington became the fifth state in the U.S. to establish a paid family and medical leave program for workers — and arguably the most forward-thinking one in the nation. 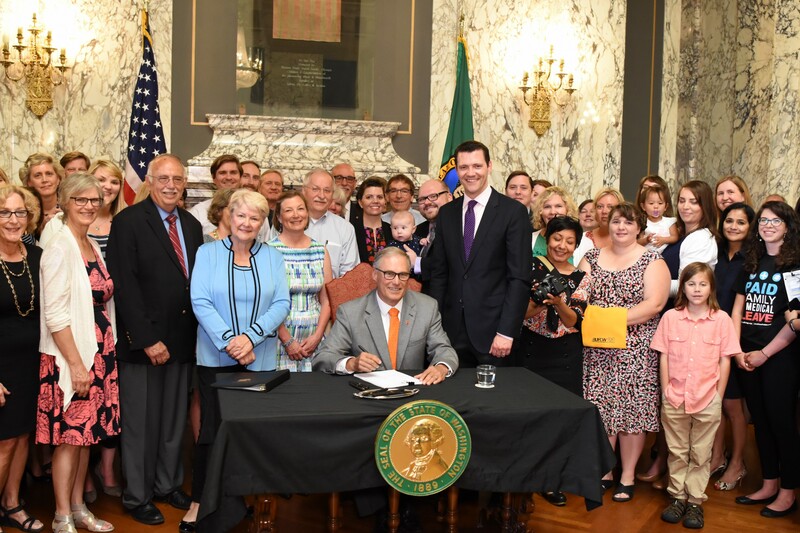 The new law Inslee signed was passed by the Legislature last week with strong bipartisan support and will be in place by 2020. It creates the Family and Medical Leave Insurance Program, which will provide everyone in the workforce with up to 12 weeks of paid medical leave, and up to 12 weeks of paid time off to care for a new child or an ailing family member. That leave is capped at 16 weeks if the employee needs both types of time off in a one-year period. Women who experience pregnancy complications may receive an additional two weeks of leave. Depending on their earnings, employees will receive up to 90 percent of their wage or salary or up to $1,000 per week during their leave. Employees become eligible for the program after working 820 hours. The new program will give workers more time to spend with their newborns, which research shows has long-term physical, emotional and social benefits for children, better preparing them for school, said paid family leave advocate Marilyn Watkins, policy director of the Economic Opportunity Institute. The program also will give people more time to care for an aging loved one, which is especially important as the state’s older population increases, and give families time to respond to unexpected medical crises. The cost of the new program will be shared between the employer and the employee through a payroll tax. Workers will pay 63 percent and employers will pay 37 percent of the premiums, but the employer could decide to pay more. For example, a full-time worker earning $15 dollars an hour would contribute $1.51 a week toward the benefit while the employer would pay 89 cents. Businesses with fewer than 50 employees will not be required to pay the employer share of the premium, but those businesses can still opt in. Businesses with fewer than 150 employees who pay into the program are eligible for grants — $1,000 to $3,000 each — to cover the cost of an employee on leave. According to the Association of Washington Business, chambers of commerce representing businesses from across the state supported the paid family leave bill. California: Eligible employees receive up to six weeks of paid family leave, which provides about 55 percent of their weekly wage not to exceed $1,173. New Jersey: Eligible employees receive six weeks of paid family leave, which provides up to $524 a week. New York: Eligible employees receive up to 12 weeks of paid family leave, which provides no more than 67 percent of the state’s average weekly wage. Rhode Island: Eligible employees of the private and public employers that opt in can receive four weeks of paid family leave. The maximum benefit allowed is 4.6 percent of the worker’s wages during the highest quarter and cannot exceed $817 a week. The effort to establish a paid family leave program in Washington goes back more than a decade. Washington lawmakers attempted to create a paid family leave program in 2007; a bill passed out of the Legislature, but its funding was never approved and subsequent laws sidelined the program. It would have required many businesses to offer five weeks of paid time off to workers who were new parents. The bill signed into law today “is a much better policy” than the 2007 bill, Watkins said. The push for paid family leave was revived in 2015, when Inslee secured a federal grant to begin designing a new program. He has pointed out that the U.S. is the only industrialized nation that does not offer paid leave for workers.